Sand Dollar Beach and Day Use Area is a beautiful narrow beach that is found in the southern section of the Big Sur coast. Jade can be found here and there are hiking trails leading into the hills. Overnight camping is available at nearby Plaskett Creek Campground. 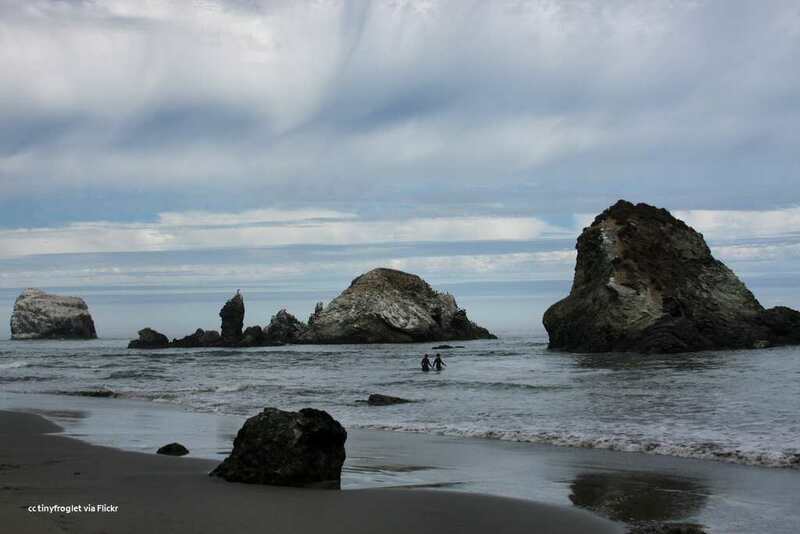 This beach is one of the few opportunities to wet your toes in the Pacific along Highway 1in Big Sur. A previous Photo of the Week selection. Clicking on any of the photos on this page will open a gallery of full-sized images for better viewing. 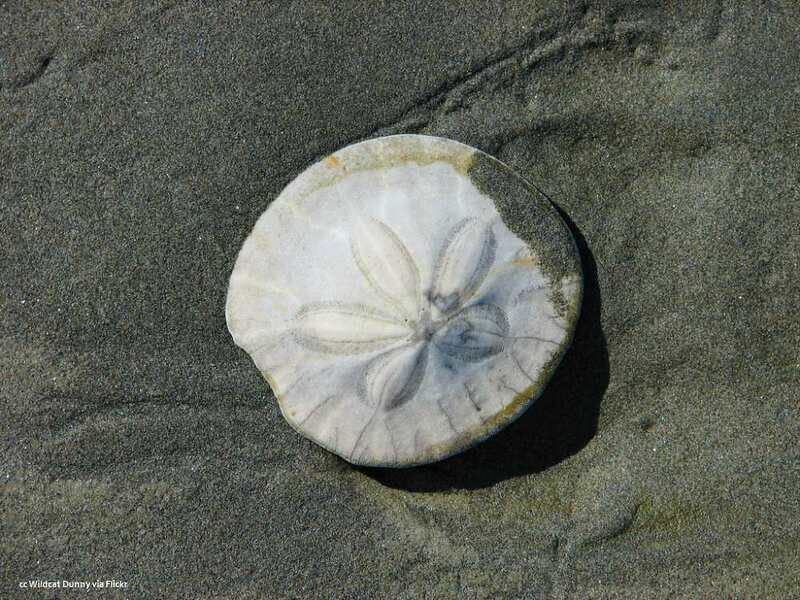 When someone thinks about California beaches, Sand Dollar is not the vision that someone imagines if they have never before visited the Big Sur coast. Compared to beaches in southern California, this beach isn't very long and is backed up hard to the bluffs making it narrow. However, that doesn't mean that you won't be pleased if you visit here. 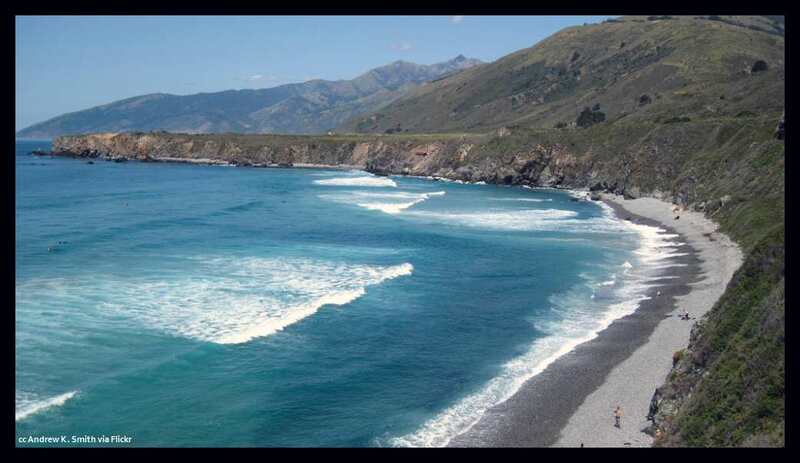 Taking the drive along Highway 1 (aka PCH or Cabrillo Highway) requires numerous breaks for viewing the spectacular scenery that Big Sur affords, if not also for rest and comfort. 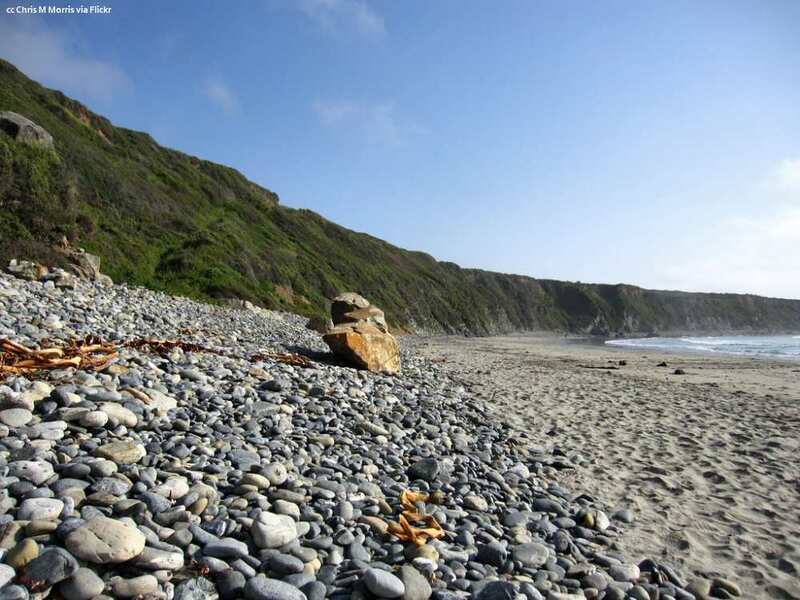 And there are few places along the 90 miles of Big Sur where you can take a restful walk along the beach like here at Sand Dollar. Organization: US Dept. of Agriculture, Forest Service. A part of the Los Padres National Forest. Services and facilities: Ample parking; restrooms and picnic areas; most shaded by trees. Accessibility: Wheelchair accessible restrooms in the parking area with handicapped parking; picnic tables; packed dirt pathway to the bluffs above the beach area. No wheelchair access to the beach proper as it is accessed only by a stairway down from the bluffs. Fee: $10 for day use; no camping here. Camping nearby: Plaskett Creek Campground (by reservation only). Lodging nearby: Treebones - 2 mi. 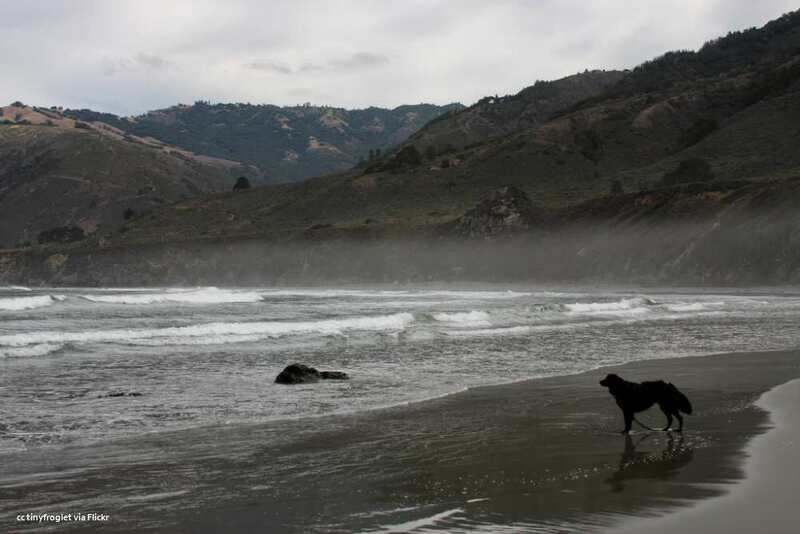 south; Ragged Point Inn - 15.4 mi south; Lucia Lodge - 9.2 mi. north. Hiking: Pacific Valley Bluff Trail. 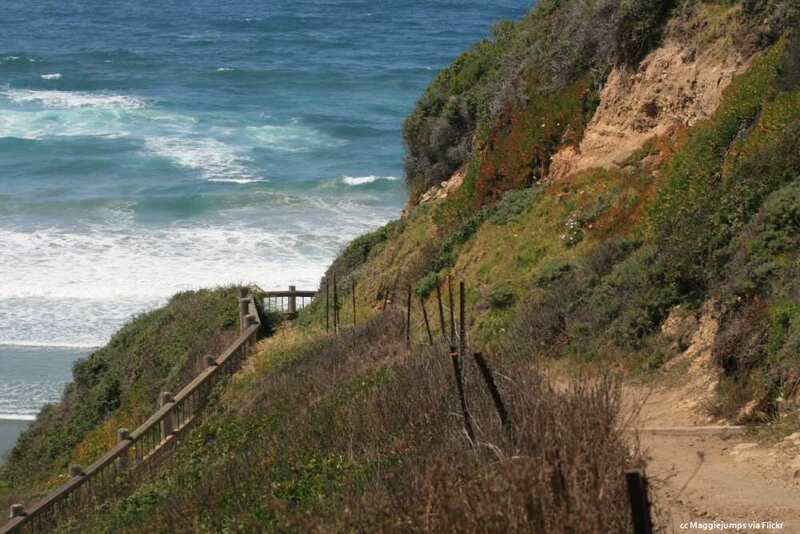 This trail is found just north of Sand Dollar and gives a great southerly look at the beach. Access is by means of a stile (stairs) over the fence and a mostly level walk to the point. Parking is alongside the road directly across from the ranger station. (Approx. mile marker 14.7) This trail can also be accessed from the Sand Dollar Day Use parking area taking the trail about 1/2 mile north. Have your say about what you just read! We welcome your comments in the box below. © 2011-2018 Discover-Central-California.com All Rights Reserved Your personal and local guide to Central California's "Hidden Treasures"